Not everybody wants to be an avid RVer. While full-timers, weekend warriors and part-timers all have their place in the RV world, some folks just want to RV here and there. They may have an annual summer vacation or get the RVing bug once a twice a year and that’s about it. For these types of RVers purchasing a motorhome that could cost tens to hundreds of thousands of dollars just doesn’t make sense. 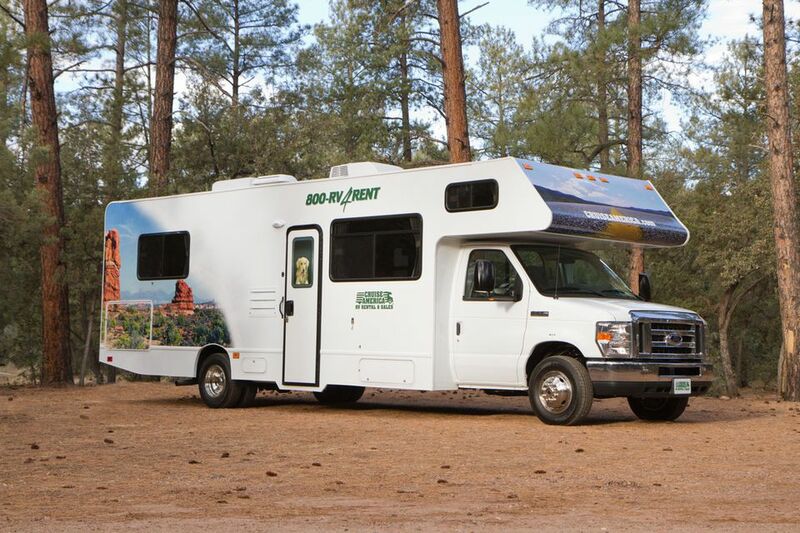 You don’t have to buy an RV to get on the road, you can just rent! The RV industry is loaded with rental joints across the country, but one of the most reliable ways to rent an RV is to use Cruise America. Let’s get to know Cruise America including what services they offer, where you can find a Cruise America location and some of the great tips and tricks they provide. You’ll be ready to rent or buy an RV from Cruise America in no time. Cruise America’s bread and butter are found in its RV rental services. Cruise America is not loaded down with rental options but for rookie RVers, this may work for their advantage. Trying to decide between a Class C, fifth wheel or diesel pusher may be a little over the head for those not too acquainted with RV types but Cruise America makes selection much easier. There are four rental options at Cruise America known as compact, standard, intermediate and large. The compact model is 19’ in length and can sleep three people, the standard model is 25’ and can sleep five people, the intermediate is 28’ and can sleep six while the large model can sleep seven and is 30’ in length. Despite the differences in sizes all models are Class C cover style motorhomes and are manufactured by Ford. Engines range from V8 to V10. The easiest way to rent from Cruise America is to visit one of their 116 locations found across the United States and Canada. You can also visit CruiseAmerica.com to get started on the rental process. Use the box found at the upper left of Cruise America’s Homepage. Enter in the city and state where you would like to pick up your RV as well as start and end dates to get a price estimate for your rental. Prices for rentals can fluctuate depending on where you’re renting, what time of the year you’re renting and how fast you need the RV. The earlier you book your rental the cheaper it will be according to the website. While rentals may be the largest part of Cruise America’s business they do purchases as well. Heck, you could rent an RV, fall in love with it and decide that same model. Click the BUY button found at the top part of CruiseAmerica.com to see what type of inventory they have in stock and get an idea of what type of prices you’re looking at. In some cases, you can buy the exact RV you’ve rented from Cruise America on a trip if you fall in love with it. What other rental company out there let consumers do that? Cruise America is a great way to get a great rental but their website also provides other resources for RVers such as a Vacation Ideas page that includes travel planning, unique RV uses, destinations, outdoor activity guide and event planning. Try these tips and ideas even if you aren’t renting from Cruise America. Renting an RV is the start of an adventure that could turn into a lifetime of exploring the great outdoors with family and friends. Services like Cruise America make it easy to find out if you love RVing and take advantage before you invest in your own rig. Cruise America provides a simple, no-frills rental service that is easy to for rookie RVers to get accustomed to. Try out Cruise America if you’re looking to rent an RV from a reputable, trustworthy and easy-going business.